This is why it is important to set goals, and make plans that help you maintain these goals. I personally find it best to prepare a healthy breakfast and lunch each morning to ensure that I do not get so hungry by lunch time that I crumble under the growls of my stomach, and go eat fast food, or that piece of cake that was generously offered. Even still, there are those days when nothing seems to be going to plan, and I am running behind with no extra time to prepare my meals. On days like these, it is great to be working at the Meigs County Health Department. In 2018, the health department opened a micro-market that sells fresh healthy food choices, such as apples, trail mix, yogurt, and water. Thus, even on days I am not able to bring healthy meals to work, I have healthy choices surrounding me, and therefore I am less likely to partake in consuming unhealthy snacks that I will later regret. A healthy lifestyle is not entirely about the food you consume, but also the physical activity you engage in. If you have a career that allows you to be active and move throughout the day that is great, for anything that brings your heart rate above what is your personal resting heart rate registers as exercise for your body. In fact, the latest version of the Physical Activity Guidelines for Americans, 2nd Edition suggest that adult Americans get anywhere from 150 minutes (2.5 hours) to 300 minutes (5 hours) of moderate-intensity exercise a week. Yet, if you are like me, and have a career that is predominately stationary it can be easy to miss out on this recommended goal. Speaking of co-worker involvement, often sticking to goals can be easier if you have a supportive partner or team to encourage you along the way. Since a great deal of your time can be spent at work, having a person or group of individuals with the same goals can make being healthy a lot easier. Again, there are going to be days when you do not feel like preparing a healthy meal, let alone eating it. Yet, if you have someone motivating you to stay on track, you are less likely to give up on your goals. Creating and/or joining a work group that is geared towards healthy lifestyle choices can help you accomplish your goals by helping you to engage in several healthy choices. For example, you can take half of your lunch break to walk outside your place of employment together, meal prep with your co-workers, and share healthy recipes, just to name a few. 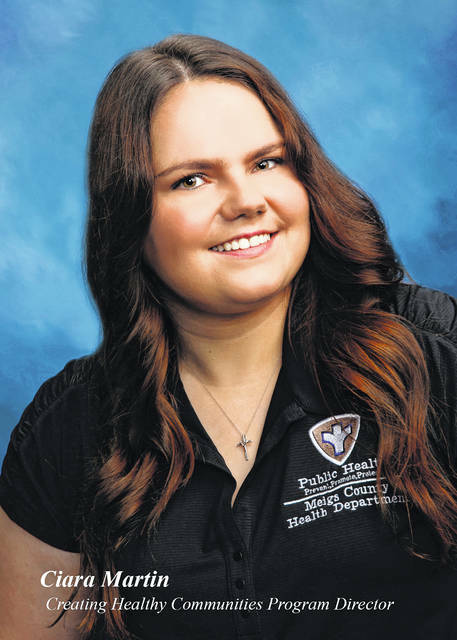 Ciara Martin is the Meigs County Health Department’s Creating Healthy Communities Program Director/Health Educator.